From top left: Eclipse sharpening guide, 25 and 20 degree sight blocks, and Marples and Stormont paring chisels. I got some useful feedback on part 1 that made me go back and do some further re-evaluation. In failing to get an edge sharp enough to slice paper, the problem was with me, not with the stones, as you'll see. Some of the feedback on this and other sharpening posts was along the lines of why be so obsessed with sharpening and perfectly flat bevels? I would counter that I'm not obsessed, I can stop thinking about this any time I want simply by knocking myself on the head hard enough with a mallet. Seriously though, it's a learning process, and these are learning goals. Let me be clear here, I'm not an expert. I'm still just a student learning the skill, working things out, and sharing what I find. Think of these as student lab reports as much as how-to guides. As I mentioned, Kingshott wrote that it took him a year as an apprentice before he felt he could get a sharp edge approaching that of his master, starting at age 14. So he was 15 by the time he felt he was reaching his goal. At 51, I'm somewhere along that path, not yet equal to that teenaged kid. That has a nice palindromic symmetry. The other feedback was why not just go ahead and use a sharpening guide? Clearly, a guide will maintain a more consistent angle while sharpening, defining the two surfaces that must meet to form an edge as perfectly flat planes. Again, it's my desire to reach a goal, in this case to be able to achieve the same level of sharpness unaided. Finally, Deneb Puchalski of Lie-Nielsen said he thought my problem was that I wasn't quite reaching the edge as I did final polishing on the 10,000 waterstone, because of the slightly convex face on the chisel. Leave it to a guy who helps people with their tools for a living to nail it. Deneb suggested I try a sweeping motion on the stone as I pulled the chisel toward me. A strop is more forgiving due its slight flexibility; it will conform to the surface as it polishes. A stone won't do that, so you have to be dead on or make sure you cross the edge. So I decided to give both a sharpening guide and Deneb's suggestion a try. First I used an Eclipse guide while repeating the sharpening process on another paring chisel. Once again, the 10,000 stone left a polished surface that looked as good I get from the strop. The difference was that now it was dead flat. This edge did indeed slice paper right off the stones, no stropping needed. In fact, I was able to slice paper both lengthwise and across it. Copier paper has a slight grain to it, cutting more easily down its length. Being able to cut across it is another threshold test, for the next increment in sharpness. So the sharpening guide does give an excellent, even superior edge. This sets the bar for me to reach when sharpening by hand. Or I could just use a guide...naaah. Next I tried Deneb's suggestion on my first chisel. I experimented with it a bit and eventually had good success. I used the coarse DiaSharp and the 1,000 waterstone exactly as before, trying to maintain a flat 25-degree bevel but still ending up with the slight convexity. Where I changed it up was on the 10,000 stone. Here I started the stroke at the far end of the stone a couple degrees under 25, then pulled back with a sweeping motion to come up just over 25. This ensured that I was conforming to the actual convex surface and crossing the edge. As before, I lifted the chisel off the stone at the near end for the return. The result: this edge would also slice paper right off the stones. Trying a little more care with it, I was even able to get it to cut across the paper. As we say here in New England, "Wicked shahp!" I did this several times, so the distance of the secondary bevel up the face in these photos is further than what you get from initial honing. The resultant edges, both paper-slicing sharp right off the stones. Left, with sharpening guide, right freehand. It's very hard to capture a shiny surface in photos; the left one especially looks rougher here than it is, with those very fine lines in the secondary bevel. To really get an idea of what these look like, look at how they reflect details. The guide-sharpened bevel is perfectly flat, but the distortion of the moon in the freehand-sharpened bevel shows the slight convexity. In repeating the test, I found something else. Close inspection of the edge turning it in the light showed that when I failed to slice paper, I could see just the tiniest bit of cruft still clinging to it. This is the stuff that the strop removes. A single stroke each side on the strop took care of it. I also found that when I had an edge at this point, instead of using a regular strop, I could strop the front and back on my palm to dress it up that last little bit needed to slice paper. Now, I'm not one of those crusty old-timers with palms like leather. As a software engineer, I don't get calluses on my hands from typing on a keyboard. But dragging it across a flexible surface is enough to clean off the edge. There are some who think it's insane to rub a sharp edge on your hand like that, and some who think it's perfectly natural. I did find it genuinely useful. 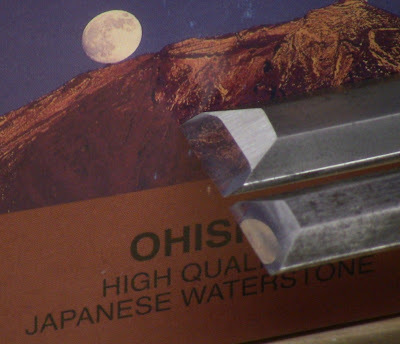 The conclusion from all this is that these Ohishi waterstones really are capable of putting a super-fine edge on your tools, you just have to use them properly. Like I said, the problem before was me, not the stones. The strop offers some forgiveness if you're having difficulty reaching that last step. As usual, the larger lesson here is to persevere, whatever method you choose. The results don't come immediately. Spend a few hours of quality time with a couple of your chisels over the course of a few days. You have to work out the fine details for yourself to get the skill down. I like your posts on this topic. It is refreshing to read articles written by folks who keep open minds and who don't present their approach as "gosphel". In my studies of sharpening I've gone through many permutations and will most likely continue to do so. The reasons I'm solidifying my present set-up have to do with things discovered that I don't enjoy as well as do enjoy. I don't enjoy getting swarf on my hands. I'm a guitarist. I don't enjoy doing water stone or oil stone flattening. 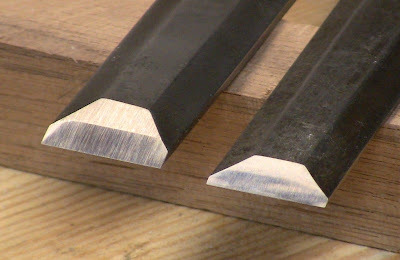 I use a variety of cutting angles on edges of chisels for different purposes- four to be specific, and two on plane blades. That's more angles than I care to master by feel/eye. Therefore, the eclipse style jig is perfect. For each application I have a projection block with stops for grinding and honing the secondary bevel. 12" square granite tiles have PSA papers, one for grinding, others with micro abrasive papers that use soapy water as a lubricant. At the end of a honing session my hands are clean, smell good, and the plate just needs to be rinsed off. The edges are perfectly polished. Like you, I strop against the side of my palm. Learned that from an instructor of Japanese hand tools.